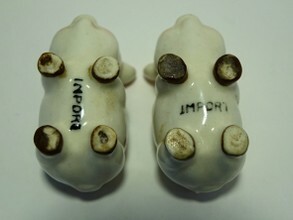 I asked specialists, I searched the internet for my question “why an IMPORT back stamp on piggybanks?”. Nobody gave me a clue, until a Swedish seller of a nice imported piggy bank (recently in my collection) gave me a hint. Reflecting the hint and combining it with what I already knew gave me a possible true background story of IMPORT on 3 of my piggy banks from Sweden with this back stamp. Sweden imported a lot in the years before 1950. Which gave a possible tax benefit if the product was marked (back stamped) as import. Assuming this I can imagine what happened with piggy banks that got (at the end) the back stamp IMPORT. These piggy banks came into Sweden as a prefabricated, not painted, not glazed product. In earthenware terms: as biscuit. In a Swedish pottery they were painted, stamped import, glazed and baked. This story, I assume that it’s the real story, should be the same in other countries like the United Kingdom. In my collection I have not only UK piggy’s with the back stamp Foreign (imported as ready for sale product, was in the early 20th century mandatory in the USA and UK) and Import.